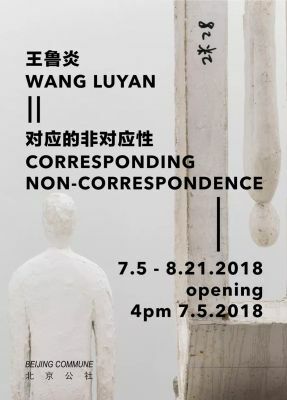 Beijing Commune is pleased to announce the opening of Wang Luyan’s first solo exhibition“Corresponding Non-correspondence” at the gallery on July 5th, 2018. The exhibition will last until August 21st, 2018. Wang Luyan considers that all things exist in relationships, and relationships all present their correspondences. Every judgment or choice made by people is made when it forms a corresponding relationship with things. Wang Luyan attempts to question the conventionalized corresponding phenomena which no longer lead people to think in a skeptical way. This exhibition will showcase dozens of the artist’s latest works in the series of "Corresponding Non-correspondence".Those works all face the paradox in various correspondences from different perspectives. Wang Luyan was born in 1956, and he has been a major participant in the developmental history of Chinese modern and contemporary art. He was a part ofthe historic Stars Art Exhibition, held along the fence outside of the National Art Museum of China in 1979, and the China / Avant-Garde Exhibition, held inside the National Art Museum of China in 1989. In 1988, together with Gu Dexin, he created Tactile Sensation. Between 1988 and 1995, he was a member of the New Measurement Group, together with Gu Dexin and Chen Shaoping. He has been featured in many important exhibitions over the years, including: Exceptional Passage—China Avant-garde Artists Exhibition, Fukuoka, Japan, 1991; Silent Energy: New Art from China, Museum of Modern Art Oxford, Oxford, 1993; Uecker Sends a Letter to Beijing (a collaborative exhibition with Group Zeroartist GüntherUecker), New Berlin Art Society (NBK), Berlin, 1995; the Second Asia-Pacific Triennial of Contemporary Art, Queensland Art Gallery, Brisbane,1996; Inside Out: New Chinese Art, Asia Society and P.S.1 Contemporary Art Center, New York, 1998; The First Guangzhou Triennial—Reinterpretation: A Decade of Experimental Chinese Art, Guangdong Museum of Art, Guangzhou, 2002; the solo exhibition Sawing or BeingSawed?, OCT Contemporary Art Terminal, Shenzhen, 2007; Wang Luyan, Total Museum, Seoul, 2010; Wang Luyan: Diagramming Allegory, Parkview Green Exhibition Hall, Beijing, 2013; Wang Luyan, Muséed'art moderne et contemporain de Saint-Etienne, 2014; and Walking, Beijing National Stadium Bird’s Nest Art Center, 2015.That same year, his work Net was exhibited at the Oceanographic Museum of Monaco, while Downward Force on Upward Moving Objects was presented at the Ekaterina Foundation in Moscow and the National Museum of China. In 2016, his solo exhibition Communication was presented in the Space of DRC No.12 in Beijing.His exhibition 2017-2018 Wang Luyan is now shown in the Yalu River Art Museum in Dandong.